LVIV, Ukraine -- About 10,000 protesters formed a human chain in the Ukrainian city of Lviv on Tuesday to demonstrate against a new education minister accused of being pro-Russian. Ukrainian students walk in a many-kilometre living chain during a mass rally in the western Ukrainian city of Lviv on March 23, 2010. 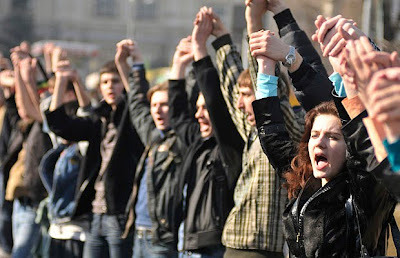 The protesters demanded the dismissal of Education and Science minister Dmytro Tabachnyk, accusing him of Ukrainophobia. The mostly student protesters formed a human chain around four kilometres long in central Lviv, a city in western Ukraine considered a stronghold of Ukrainian nationalism, an AFP correspondent witnessed. "Down with Tabachnik!" protesters shouted, referring to Education Minister Dmytro Tabachnik, who was appointed earlier this month by Ukraine's new President Viktor Yanukovych. Protesters held signs with slogans such as "We will not dance to music from Moscow" and "Tabachnik is harmful for Ukraine." The rally, which temporarily blocked traffic, came after a similar demonstration in Lviv last week that drew 5,000 people. Tabachnik, a historian with a reputation as a Russophile, has angered nationalists by saying Russian should become an official state language alongside Ukrainian. Ukraine, a former Soviet republic of 46 million people, is divided between a Ukrainian-speaking west and a Russian-speaking east. Yanukovych, a politician whose power base lies in the Russian-speaking east, was inaugurated as president last month after voters rejected his fiercely anti-Moscow predecessor, Viktor Yushchenko.